2016 Cadillac Escalade with features such as rear camera, keyless go, bluetooth system. It has other color interior and is Brown. GCC spec. GCC spec Cadillac Escalade with ABS, 22″ wheels and Power windows. Price reduced! Black 2011 SUV/Crossover. Burgundy interior. It features climate control, 18 inch wheels and leather seats. White SUV/Crossover with brown inside. It has power locks and air conditioning and has 22 inch wheels. 2017 Cadillac Escalade with features such as power locks, ABS, power windows. It has beige interior and is Black. GCC spec. Automatic 2015 Cadillac Escalade price AED 155,000, with 20 inch wheels, panoramic roof, AUX audio in, beige interior, black exterior. GCC spec. GCC spec Cadillac Escalade with Tuner/radio, 22″ wheels and Spoiler. Price reduced! Brown 2015 8 cylinder SUV/Crossover. Beige interior. It has rear camera and premium paint. 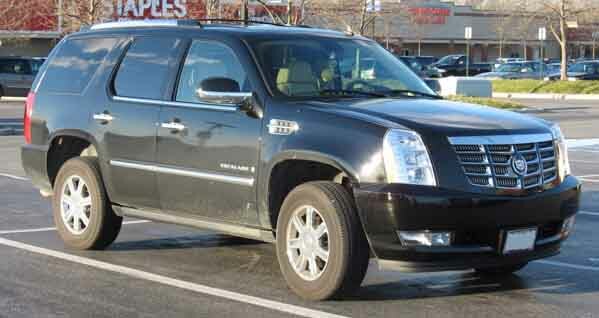 Hamoud - I bought my second hand Cadillac Escalade ESV Platinum late last year for a reasonable price. Much better than the Navigator. These cars are well equipped, very spacious inside and is perfect for my entire family. Pros: Comfort, space and price. Farooq - My import pre owned Cadillac Escalade EXT can’t be beaten when it comes to driving the streets of the UAE. People move out the way quickly, it's incredibly roomy and has great features for long distance driving. I recommend these cars to everyone. Pros: Size, power and comfort. Aboud - Got one of these cars used for an excellent price recently. It’s an old model, but that doesn't mean it’s bad. Very spacious and the options are decent for its age. Cruise control, leather seats and a powerful sound system is all I need. There is a VVIP package available which not only removes one of the second-row seats but fills the SUV with every option under the sun! Long commutes? The Escalade is perfect as it's not only comfortable, it’s spacious and with only two people inside space significantly improves. In the latest trim, it's packed with safety features that can’t be beaten. The V8 petrol motor provides a smooth and comfortable ride. In its second generation, it was available as a pickup and is certainly one of the most luxurious trucks around. General Motors needs a big brutish luxury SUV to tackle the likes of Ford and others. Based on GM’s successful SUVs, the Escalade is stock with leather seats and a massive V8. Most notably used by families with lots of money, this SUV makes an impact wherever it goes. Road Rivals: Infiniti QX80, Lincoln Navigator, Lexus LX570 and the Land Rover Range Rover. 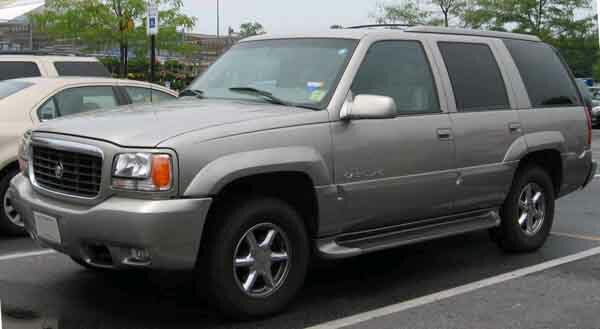 In its first generation, the Escalade borrowed many features from the GMC Yukon, Chevrolet Tahoe hence the noticeable similarities The SUV is only available as a four-door. Exterior options include roof rails, 18-inch rims on each corner and fog lights. Inside, the Escalade has leather seats, a BOSE premium sound system which was a first for any SUV at the time, CD player, radio tuner, basic power accessories. Powering the rear wheels as standard is a 5.7-litre V8 petrol motor mated to a 4-speed automatic gearbox. 255 horsepower spits out the rear end and four-wheel drive is an optional extra. Want to buy a used Cadillac Escalade for sale in Dubai, UAE? Prices start at AED 20,000. 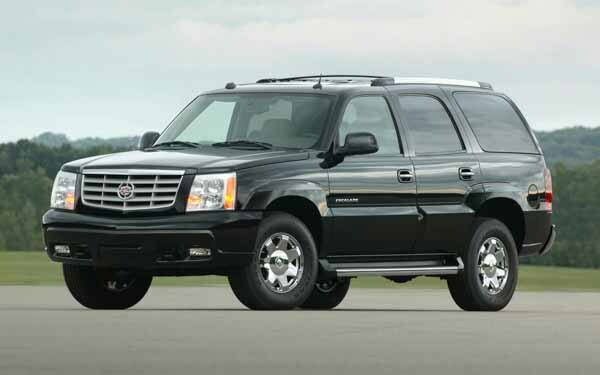 In its second generation, the Cadillac Escalade expands and takes a boxy shape. It missed the 2001 launch window due to a chassis change. Alongside the traditional SUV is a new pickup variant. Four trim levels are available in this generation including base, EXT, ESV and ESV Platinum. Options remain identical to the previous generation, with the inclusion of new features such as an upgraded Electronic Stability Control System, indicators mounted on each side mirror, Low Beam Headlights, power adjustable pedals and parking sensors. ESV Platinum models are stock with 20-inch rims, lower suspension, cooled seats for front passengers, moonroof, cooled and heated cup holders, rear entertainment package and a chrome grille. Pickup models retained the options but don’t feature the third row for obvious reasons. Rear-wheel drive is standard once again. Power comes from two V8’s either a 5.3-litre of a 6-litre petrol engine. Both are mated to a 4-speed automatic gearbox with four wheel drive being available too. In 2004, the 5.3-litre version was updated. Looking for a pre owned Cadillac Escalade for sale in Dubai, UAE? Prices start at AED 40,000. In its third generation, the Escalade receives a new rounded look all while retaining unique characteristics of the massive SUV. Larger inside and out, the SUV and pickup body styles are both available. Standard features grew to include leather seats, climate control, media inputs, multi-function steering wheel, remote engine start, cruise control modes, premium sound system, CD player, Compass and rear powered liftgate. Platinum models are equipped with all of the above and rear entertainment system navigation, heated and cooled cup holders, rear view camera, cooled front seats and premium leather upholstery and power side skirts. Gone is the choice of engines, instead, a single 6.2-litre petrol motor powers the rear wheels as standard or four-wheel drive in select models. Hooked up to a CVT or six-speed automatic gearbox. A hybrid version of the Escalade exists with a 6-litre petrol engine paired with an electric motor. Looking for a used Cadillac Escalade in Dubai, UAE? Prices start at AED 59,000. In its fourth Generation, the Escalade is completely redesigned. While there are telltale signs of the previous generation, these models have new lights on both ends with rear ones reminiscing Darth Vader’s lightsaber. Inside the cabin is completely redesigned and unfortunately there is no pickup variant but there is an extended wheelbase one. Standard features include everything from the previous generation as well as 20-inch rims, cooled seats, Bluetooth connectivity, Magnetic Ride Control, Front and side airbags, ABS, Stability Control and cruise control. Driver awareness packages add forward collision detection, lane departure assist and safety alert seat. Driver Assist package adds adaptive cruise control, side blind zone alert, rear cross traffic alert, lane departure assist, automatic safety belt tightening, front and rear automatic braking. Powering the rear wheels as standard is the same 6.2-litre V8 petrol engine from the previous generation. A six-speed automatic is the only gearbox of choice and four wheel drive is available. Looking for a second hand Cadillac Escalade for sale in Dubai, UAE? Prices start at AED 259,000.